War moved 21-year old refugee Ygeutte Rudahindwa from Democratic Republic of the Congo to Uganda at the age of 10 where she stayed for 11 years, attending high school, before feeling unwanted and running into problems with people in the refugee camp. Rudahindwa has found a home in Buffalo and has spent the last six months at the Herkimer School on 228 Albany Street learning English. The Adult EducationDivision of the Buffalo Public Schools offers a variety of classes in about 30 locations throughout the city. Herkimer School is one of the 12 locations offering English classes like Rudahindwa’s. High school equivalency and vocational programs are housed in other sites. Buffalo’s number of English Language Learners has surpassed the total enrollment of the Buffalo School District for the past eight years., according to New York State United Teachers. Rudahindwa, an exceptional student currently placed in an advanced level class at the Herkimer School, has only been here since September and has grasped the fundamentals of the English language. She speaks four other languages such as French, Mashi, Luganda and her native language Swahili. The Herkimer School has a partnership with Catholic Charities of Buffalo, one of four resettlement agencies in Buffalo. Catholic Charities offers the facility and Adult Education Division supplies the English learning classes. Doreen Regan, English as a Second Language coordinator of Adult Education Division and English teacher is impressed by Rudahindwa’s growth being enrolled in this ESL program for such a short period of time. Regan worked there for 25 years and was a director for six years. The Herkimer School teaches students that from all over the world. Most of the refugee students are from Congo, Somalia, Sudan, Iraq, Syria, Nepal and Burma. The immigrant population at the school is from China, South America and Puerto Rico. “It’s a real privilege because you get to learn (about) students from around the world and help them create inspiring work,” said English teacher Maria Eley,said. As Mayor Byron Brown said in January, Buffalo is a refugee resettlement city. These people traveled across the world to join a community they can call home and these programs make sure to foster a sense of belonging, Regan said. “It’s very important to feel comfortable, at home and to not feel threatened. A lot of our students have post-traumatic stress disorder, they’ve come from war-torn countries, been through a lot of trauma so we try to create an environment where they feel safe and wanted,” Regan said. Catholic Charities offers an eight-week cultural orientation class called ‘Newcomer” where students learn how to navigate the city and get adjusted before they transition into ESL classes..
“I was kind of nervous and scared because everything was new. The teachers were new to me but when I started, the teachers were nice because they know me. They’re so cool,” Rudahindwa said. Upon entering the program at the Herkimer School, students get pre-tested and placed in classes based on their English proficiency level. They are tested to measure their progress before they can move to the next level of learning. There are several factors that are important to learn English. Age and background information are the two most important, as they are the main things that will help someone learn English more quickly. However, if the student doesn’t come from an educational background, a new language would be harder to grasp, Regan said. “On average it takes three to five years to have conversational English and it takes five to seven years to have academic English. It can be a seven-year process to really become proficient in being able to handle college level material,” Regan said. Regan said assessment advisement instructors act as career advisers at the program who help them find employment. They are assigned case managers through their resettlement agencies who help them deal with personal issues. The Buffalo school district is looking for multilingual teacher aides and Regan is looking to give Rudahindwa an opportunity to find employment at one of these places because she enjoys working with kids. The name Ygeutte means, “found,” in Swahili and true to her name, not only has found a home but a possible future. Saturday’s a school day at Lafayette H.S. Students from grades 7 through 12 rushed through the big wooden doors of Lafayette High School to get ready to participate at the Saturday Academy. As kids signed in at the front table, they received a free breakfast and sat as they waited patiently to start learning on this Saturday morning. Volunteers from all over Western New York set up and got the classrooms ready for activities. Lafayette High is one of the four Community Schools in Buffalo that are open on Saturdays for activities such as sports, music and cooking classes. High School students are able to take SAT prep classes on Saturdays to help prepare for the standardized test. The Saturday Academy at Lafayette started in October and will be held every Saturday throughout the school year from 9 a.m. to 12 p.m. The Saturday academy helps the kids to learn even on the weekends. The Saturday Academy is not only for students, but it’s for the parents and the community as well. Parents are invited to parent learning courses that are open to everyone in the community. Volunteers come in to help out the kids during the Saturday academy activities. Diana Leiker, a deacon with the Episcopal Diocese of Western New York said St. Peter’s Episcopal Church and at St. Benedict’s Roman Catholic Church came together to help the refugees feel that this is a place where they should feel safe. “The whole premise to give refugees a place to practice English and meet some everyday Americans in a non- threatening environment,” Leiker said. Leiker and her volunteers feel the need to meet with these children and to get to know one another. The volunteers prepared lunches for the children at the academy and created a game so everyone could get a chance to talk to one another by asking them a question. “What we want to want to do it let the refuges know they’re welcomed and give them a chance to meet some people,” Leiker said. The Saturday Academy is free and it is encouraged for families to come and participate. The kids that participate are from all over Buffalo, and not just the West Side. Free transportation is given to the kids who lived too far away to walk to Lafayette High. “Sometimes we also have parents who come for activities that involves parents and also the community members so this is open for everyone, the students and the parents,” Mtiranyabigara said. The academy is a place for students to learn new languages and Lafayette has many students who speak different languages. Lafayette High Principal John Starkey spoke over the loud speaker during the academy in different languages for all students to understand. Buffalo School teacher, Evelyn Arent, said that teaching is her passion and the kids mean a lot to her. Arent said that the program for the kids focuses on their culture and finding their identity. The community involvement is one of the reasons why the Community Schools run today. The faculty, volunteers and the families and all work together to make the children’s time at school fun on a Saturday. The final day of classes before a break usually brings upon a routine: students go to their classes, squirm in their seats and keep a keen eye on the clock, impatiently waiting for the class to end. They’re ready to go and relax for a few days. This isn’t the case for students participating in volunteer and service-learning programs; their work is just beginning. Each of the four college campuses across the West Side offers its own varieties of these programs. Canisius College offers an annual Service-Immersion program through its Campus Ministry, which has taken place for more than 25 years. Students travel to New York City, Erie, Syracuse, Appalachia,Jamaica, India, Poland and El Salvador to interact with people in those communities and grow in solidarity. Through the service-immersion, the hope is that it increases awareness of the world, gives help where it is needed, challenge themselves to live a more simplified life and go into these areas and find God in someway to ultimately become part of the solution. SUNYBuffalo State offers alternative breaks throughout the year as well. It offered an alternative fall break. The students stayed in Buffalo and worked to bring awareness to the issue of homelessness. There will also be an alternative winter break, students will travel to Washington D.C. to bring awareness to homelessness and food-insecurity. There is a fee for the break, usually around $200, which covers the cost of the student’s room and food for the trip. But, beginning this year there will be a scholarship offered so that it can broaden the demographic of students who can apply for it. “I think alternative breaks are a really unique experience for students here on campus,” Molly Diamond, co-coordinator of alternative break said. “Alternative breaks really hope to connect social issues and why things are happening and how things are happening, to students lives and also going out in the community and getting our hands dirty and taking that information that we learned and really applying it to different communities to making a difference. The breaks are also led by students, the upcoming alternative fall break will be led by junior Sasa Vann and senior Allie Diamond. Vann stated that she did a lot of volunteer work in high school and found this as a way to continue that throughout college, which is why she decided to lead one of the breaks. Both Vann and Diamond also expressed that the educational aspect of the alternative break is one of the most important aspects of it. Medaille College offers an alternative spring break, through the non-profit group Heifer International. The break is primarily for its Vet Tech students, in which they travel to Massachusetts to work on a farm and reflect on the experiences. According to Bridget Brace-MacDonald, director of the center for community-based learning at Medaille, it is offered because of the potential impact it can have on its students and their professional and personal development. D’Youville College offers programs that integrate community service with instruction and reflection, it allows the students to learn civic responsibility and return it to their communities. It offers an annual trip to New Orleans which is a weeklong experience at the end of the fall semester where the students help those in need. D’Youville also offers local service projects as well. 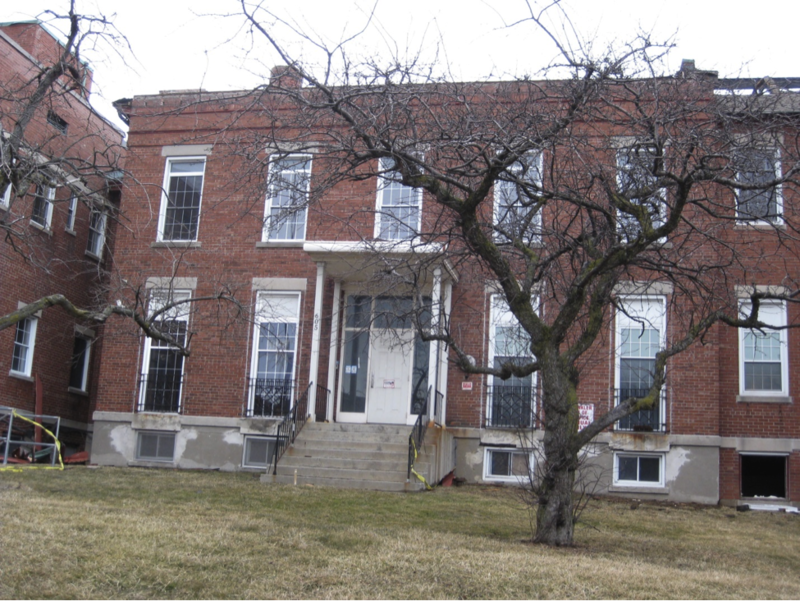 D’Youville College will begin demolition in mid-April as part of the school’s $20 million construction project on 606 Niagara St.in an effort to stay current and competitive. Renovation has already begun on the new 85,000 square foot Arts, Sciences, and Education building, which will replace the 40-year-old Dr. Pauline Alt building on the college campus, said Ed Cogan, the associate vice president for operations for D’Youville. Financing for the project is not complete, but the D’Youville College Institutional Advancement Group is working with local foundations involved with sciences for funding of the project. Donors will be given naming rights to building. The building at 606 Niagara St. is centered by the historic Letchworth family mansion, which most recently housed Gateway-Longview, a child and family service organization. The 60,000 square foot building currently has three sections, built in 1922, 1928, and 1952. According to Cogan, the college will retain the façade of the 1922 section and gut or demolish everything else. He said originally, the college wanted to keep the entire building, but the layout would not accommodate the space needed. Uniland Development, of Amherst is the general contractor. “The main crux of it is that the college knew it needed to stay current with the new sciences because a lot of things have changed with labs in the last 40 years,” Cogan said. One other reason D’Youville wanted to create more new science labs was because the current site of the labs, the Alt Building, contains asbestos. The building was built in the late 1960s and has not been upgraded to match the changing technologies. The college’s best option is to move the labs to the new building then focus on renovating and removing the asbestos from the Alt Building, Cogan said. The new building will include a 50-car parking lot, but parking still remains a concern for some students, including Jennifer Woelfel, a biology major, who said the majority of her classes will be in the new building. “One of the only concerns I have is for parking, whether or not they will be able to provide adequate spots for all the people using this new building,” Woelfel said. The student also had safety concerns despite the proximity of the building to the rest of the campus. She did acknowledge, however, the type of impact this could have on Niagara Street. “Hopefully it helps turn Niagara into a better area,” she said. D’Youville hopes to gain a competitive edge with the new building. 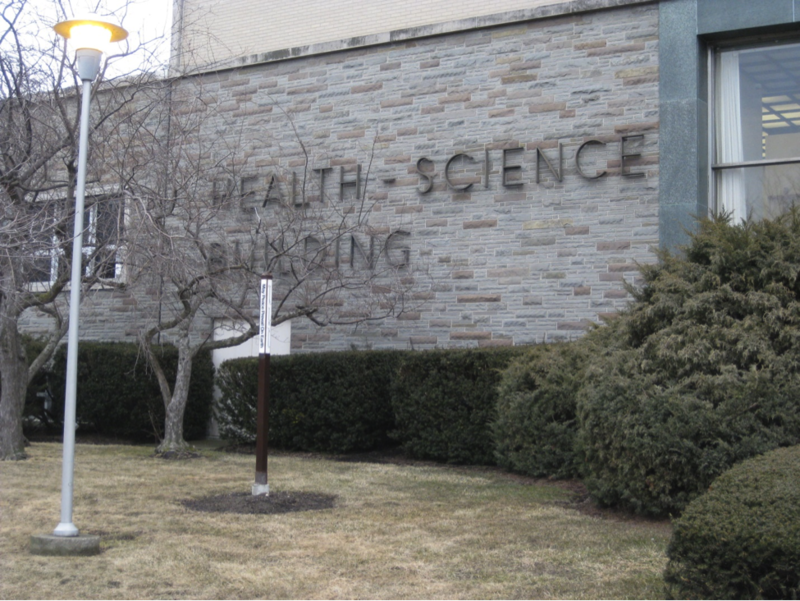 SUNY Buffalo State and Canisius College have upgraded their art and science buildings. 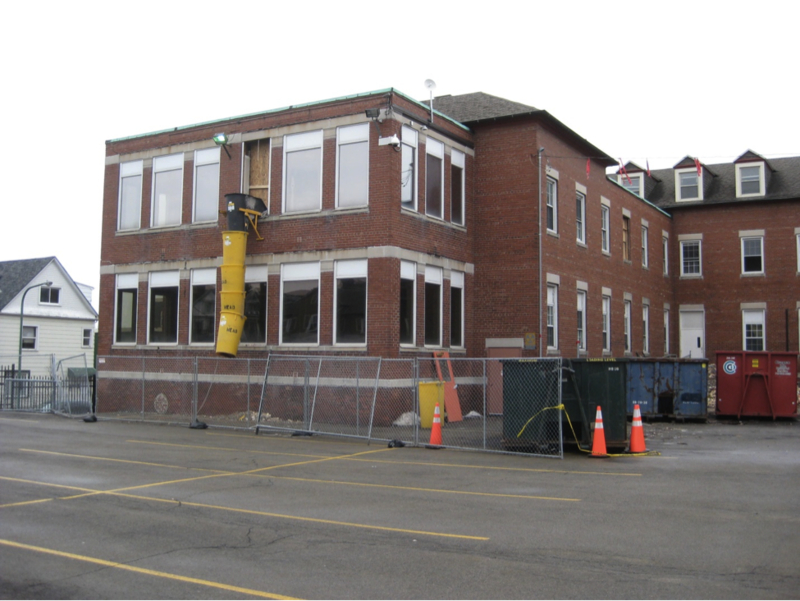 Renovations underway at back of 606 Niagara St.
“We are building a new art, science, and education building to stay competitive with local colleges and it’s something we wanted to do,” said Cogan. Cogan said that D’Youville let the surrounding neighborhood know about the renovation plans during a community meeting. “Over 100 people showed up, and were thrilled that the college was going to make a new building for local use instead of just tearing down another building,” said Cogan. The college also purchased five years ago the lot on the corner of Fourth Street and Porter Avenue where the original Ted’s Hot Dog restaurant was located. The college plans to add a soccer field to the list of renovations coming to D’Youville. Canisius High School, a private all boys’ Jesuit institution on Delaware Avenue, is known for helping perceived “less fortunate” communities like the West Side. But one trip in December to Frank A. Sedita School 30 not only changed the pre-conceived notions some students had but changed their hearts as well. Griffin Schultz, a Canisius senior and East Amherst resident, had a stereotype of the West Side that some can relate to. He used to eschew the idea of living or even traveling to the region, since it had a high crime rate. About 50 percent of the West Side is Hispanic and African American. According to www.city-data.comhttp://www.city-data.com/neighborhood/West-Side-Buffalo-NY.html, 44.3 percent of people fall below the poverty line in the region. Along with this, 15.2 percent of them speak very little English, or none at all. Schultz and 40 of his classmates traveled in December to School 30, located at 21 Lowell St., to help with holiday celebrations and participate in afterschool activities with kids in kindergarten and first and second grades. They decorated the gym and threw a holiday party for all the kids. Schultz and his classmates put smiles on the kids’ faces and left an impression not only with them, but also with Schultz himself. And earlier this month, Canisius returned to School 30 for a visit that paired about 25 high school students with sixth and seventh graders to serve as "big brothers," Ann Marie Moscovic, a Canisius counselor and the program’s leader, said. One of the students who spoke Spanish fluently is Thomas Ezquerro, a senior at Canisius. Ezquerro, a Lackawanna native, said he spent a great deal of his early childhood on the West Side. Ezquerro explained that even though the region has its struggles, there are many great things that go on there. Many students from Canisius come from the suburbs, and a lot are overwhelmed by the West Side at first. Ezquerro explained that many of his classmates were frightened due to the pre-conceived notions they had for the region. “I noticed many students were jumpy and nervous when they went on their first service. They would ask me where they should park their car, if they should lock their doors, or cover anything up,” Ezquerro said. West Buffalo Charter School has adopted the Common Core standards for learning and added more than 100 second- and third-grade students to its building on Lafayette Avenue. 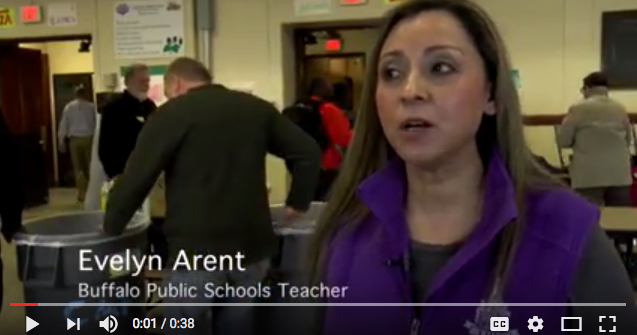 Third grade teacher Rachel Banas under the Common Core, student are not just solving problems, they're thinking them through and making connections. “It’s challenging but you see their thinking has changed,” Banas said. WBCS has small classes with a total of 24 students, a teacher and teacher’s assistant. In addition to the assistant. A smaller classroom leaves room for teachers to help students more affectively. Teachers at WBCS can figure out what level each student is at and help them grow. Principal Andrea Todoro says smaller classes also make it easier to enforce the Common Core curriculum. The support doesn’t stop with just teachers and students. Parents are also supporters of the new curriculum at WBCS. Todoro said that the school hosted parent nights where the differences between thenew curriculum and the old were compared and explained . Parents have also been invited in to see Common Core being taught. “I think once you empower them with knowledge they understand what it is and they can see it coming home in their child’s book bag and then they respond positively,” said Principal Todoro said. Along with the new curriculum WBCS has recently added a class of second graders and three third grade classes of third grade. The additional grades brought more than 100 students to the school. Todoro said the biggest impacts of the new students are space and budget. “There are more bodies in the school so traffic flow, use of the lunchroom and scheduling is all impacted by the additional students,” Todoro said. Todoro said planning for the extra classrooms, purchasing the furniture and the technology, and staffing has impacted the budget. WBSC’s had originally planned to expand out of the building creating a new wing, four floors total, and a new gymnasium. Those plans have been put on hold. Instead the school will add fourth grade classes and renovate the first floor. The original plans were denied by the State of Education because the charter school is too new, Todoro said . The cost of the original expansion would have been $2 million. WBSC has worked out a new plan to renovate the first floor where the cafeteria is located along with a long corridor hall. The new project will add three new classrooms for the incoming fourth graders this May. The project will cost WBCS $400,000 including furniture and technology. “We’ve made use of every inch of the building now that we’ve been in here for a couple of years. We know what spaces we’re utilizing and what spaces we’re not…so we’re reworking the interior,” said finance and operations officer, Elizabeth Sterns. Although school leaders were disappointed that the school couldn’t expand the way they intended, they are still excited to be renovating. “I’m really excited about it, it’s an opportunity for us to take what we already have and make it better. I think it’s more fiscally conservative to do it the way we’re doing it. It’s kind of like staying in your starter home longer than you would have normally,” Sterns said. Sterns also mentioned that other successful charters have taken the same route. The original project wasn’t a complete fail. Sterns says the school not has the opportunity to save money and tackle the expansion outside the building in a better financial footing. VERY GOOD JOB ON THE VIDEO. INFORMATION IS ADDED TO THE STORY, RULE OF THIRDS NICELY APPLIED, TODOR IS SOLDLY IN THE LEFT VERTICAL, HEADROOM AND LEADROOM ARE PERFECT. AUDIO IS CLEAR. B-ROLL CORRESPONDS WITH AUDIO. In September, NBC kicked of its 39th season of the popular variety show Saturday Night Live, but at SUNY Buffalo State the laughs start 24 hours earlier. Friday Night Live, better known as FNL, takes place in the Donald Savage Theater on the Buffalo State campus and provides entertainment to not only students, but anyone in the community looking for some laughter. 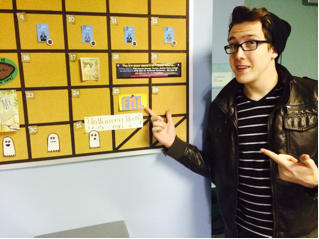 Buffalo’s West Side isn’t known for is its comedy scene, but FNL could be changing that. “It’s nice because people can let off some steam after a long week and just sit back and enjoy the show,” Needham said. For West Side residents there aren’t that many places to go for live comedy that's free of charge. In 2007 Buffalo State unveiled the brand new improv show, but you would have never known it. “It’s changed so much, back when we first started we used to draw in like 15 people a night but now we get around 200 every night,” Needham said. Growing crowds is a testament to the format of the show, which keeps performers on their toes at all times. For Needham, getting into comedy wasn’t the original plan. He originally intended on coming to Buffalo State College as a music major, but after getting denied entry from the department after his first audition, he had to make a sudden change in plans. It’s performers like Needham that make FNL so successful. But improv isn’t something performers are classically taught, making the experience not only rewarding for the audience but for the performers as well. Tiebor, like Needham, agrees that FNL is something that will continue to grow and have a positive impact on the community for years to come. “FNL is great for the local and [Buffalo] State community,” Tiebor said. “It’s free, it’s funny, it’s engaging and is great alternative to sitting around or going drinking."